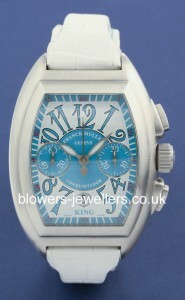 Franck Muller is a brand that is famous for its highly complicated movements. 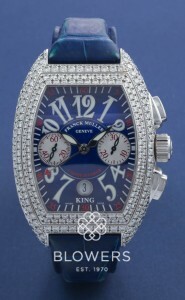 In the 80s, Muller became obsessed with the tourbillion and took to presenting the mechanism on the dial. 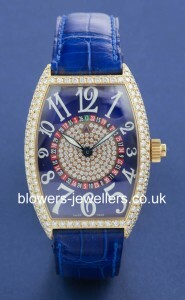 Offering rectangular, round, and square shaped watches, Franck Muller is most recognisable for its iconic Cintrée Curvex™ shape, as well as the bold and daring use of colours and precious stones. Popular collections include the Conquistador and the Casablanca. 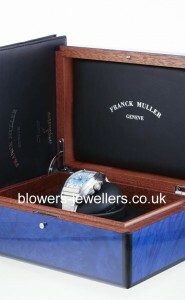 Browse Blowers’ stock of unused and used Franck Muller watches. Looking for a particular model? Get in touch and we will endeavour to source it for you.